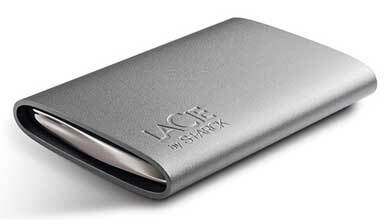 LaCie’s Starck Mobile Hard Drive is a stylish, Mac-friendly aluminum USB drive that features a sturdy aluminum exterior, unconventionally slick curves, and a wealth of enticing features that should excite hardware enthusiasts. Over the years, LaCie has worked with a number of high-profile designers to make drives that range from simple and modern F.A Porsche designs to more whimsical designs of Ora Ito. This latest collaboration continues that trend. This new drive combines the hearty security of an aluminum armor case with the curved style of something Iomega might produce. When I first connected the Starck Mobile Hard Drive, the LaCie Setup Assistant started up and asked how I would like to format the drive. I clicked on Mac and in seconds it was reformatted to Mac Journaled HFS and therefore also Time Machine compatible. The drive also comes with the LaCie Mac utility Intego Backup Assistant for Mac. The Starck Mobile features a “curvilinear” aluminum flask design and an embedded USB cable about six inches in length. Nestled cleverly in the back of the drive, the flexible rubber cable can be coiled back inside the drive for easy transport or extracted to plug into any USB port. The 2mm of resistant aluminum casing ensures the drive feels sturdier than many portable drives, but unfortunately I found this extra armor makes the drive feel much heavier than competing drives. It’s still plenty portable, but you’ll want to store the drive in your backpack rather than your back pocket. While the USB connectivity ensures that nearly everyone can use the Starck drive, USB has its limitations. USB is generally slower than FireWire or eSATA connections on a Mac, so speed will not be the focus of these drives. Older model laptops may have difficulty producing enough power to spin the mechanism of the Starck Mobile. Thankfully, an included power sharing cable enables the unit to draw power from an additional USB port, thereby allowing even older laptop models to use the Starck Mobile. In our lab tests, we found the Starck Mobile to be surprisingly fast for a USB drive. The 1GB copy test finished in 44 seconds—a new lab record for a USB connection. The duplication test was also impressive, besting Western Digital’s My Passport for Mac ( ; 1 minutes and 15 seconds) and Buffalo’s MiniStation TurboUSB Portable Hard Drive ( ; 1 minute and 14 seconds). These times are not only impressive for a USB connection, but also make the Starck Mobile competitive with some FireWire 800 drives. However, the Starck Mobile came back to earth a bit in our Low-memory Photoshop tests, finishing consistently at around 1 minute and 40 seconds, a full 10 seconds off the My Passport’s time. The complicated regime of smaller tests that comprises our Photoshop trial often means that the drive isn’t meant to handle multiple processes. The Starck Mobile is available in 320GB and 500GB capacities with the 320GB version priced at $100. Both are comparatively inexpensive compared to competing USB-only drives, and the stylish looks of the drives will generate envious looks from other developers and consumers alike. The price per gigabyte is about $.32 which is comparatively average for a mobile external drive. The model we tested used a Samsung HM320II hard drive with a 5400 rpm mechanism, though LaCie states they will be changing the producer of the drive mechanism throughout the drive’s release. Perhaps due to the low-rpm and thick exterior shell, the drive ran cool and comparatively quiet. I’ve yet to handle a mobile drive that feels as tough as the LaCie Starck Mobile. Additionally, its copy and duplication tests are very, very impressive and the inclusion of the power-splitter cable means that LaCie recognizes the importance of making their drives completely universal. The speed, universality, toughness, and Mac-ready features for the drive make it highly recommendable to those with moderate to medium storage needs.